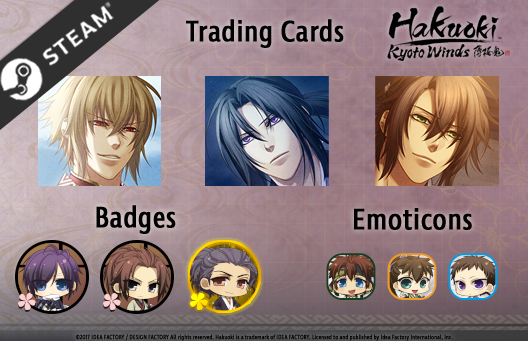 Hakuoki: Kyoto Winds comes to Steam 8/24 with Trading Cards, Emoticons, Steam Profile Backgrounds, and Badges! Collect these handsome rewards and more as you play! And to celebrate the launch of Hakuoki: Kyoto Winds on Steam next week, we’re holding a contest in the Hakuoki: Kyoto Winds Discussions page! Tell us who your favorite character is for a chance to win a FREE Hakuoki: Kyoto Winds Steam code + 2 Hakuoki sticker sheets!